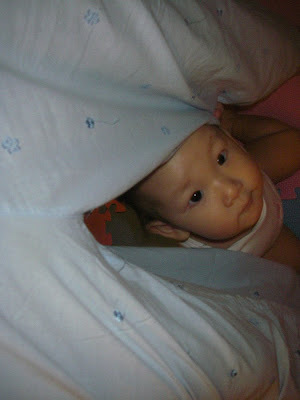 Natalie is becoming more and more playful and will take the initiative to incite the people around her to play with her. This includes yelling and pointing at someone, crawling over to give you a toy, raising her arms in a "pick me up now" pose, or even crawling over from behind to pull at my pants and peek up and smile at me (see pic below). Watch Video 125 of Natalie playing with us. She's very "busy" now. In cantonese, we would say she likes to "gow gow juhn". If we're chilling at home, Natalie will happily bang toys together, sort objects, and talk on the phone (she knows how to turn it on, but not off). She also likes to put small objects into bigger objects, open and close doors, pull out books and flip through them, and "find" things. She's non-stop! Natalie crawled up from behind me to peek up and smile at me. She found this game really fun and did it over and over again. Natalie wearing a bucket hat. 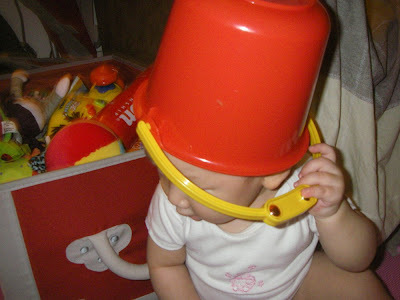 She gives me the bucket and laughs when I put it on my head. But she doesn't find it quite so funny when I put it on her head.